KKR's R Vinay Kumar failed to defend 17 runs in the last over against CSK last night in Chennai. 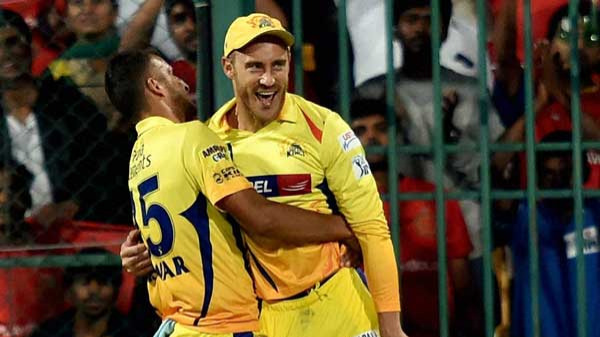 Chennai Super Kings made a triumphant return to their home ground of Chepauk or MA Chidambaram in Chennai, with a five wicket win over Kolkata Knight Riders in the last over. CSK needed 17 runs to win off the last over bowled by KKR medium pacer R Vinay Kumar. Vinay Kumar started off with a no ball, which Bravo deposited for a six and then Jadeja and Bravo took some singles and doubles. With 4 runs needed off the last 2 balls, Vinay Kumar bowled a length ball, which Jadeja deposited over the long on boundary. KKR fans were not happy with the decision to give the last over to Vinay Kumar and the way Vinay Kumar bowled a no ball on the first ball. KKR batted first after losing the toss, and put up 202/6 thanks to 88* by Andre Russell, and contributions from other batsmen like Sunil Narine and Robin Uthappa. KKR needed upwards of 51 runs in the last four overs and that’s when Sam Billings started going berserk, hitting Russell for two sixes in the 18th over. Billings hit Curran for a six in the penultimate over, but holed out the next ball and left CSK 17 runs to get off the last over.